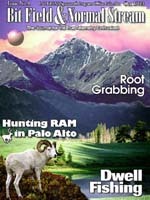 A magazine for the True Telemetry Enthusiast, Vol. 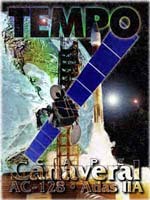 1, Issue 1, Oct 1993. A difficult and complex collaboration. Hats off! We made lots of products including posters, greeting cards, mouse pads and 25 personalized posters with pictures of each of the team members. The Alcatel logo was subsequently removed. 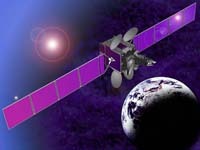 This was Tempo-2, and has been renamed DirecTV-6. Still flying. This was the first of two posters for SS/L. The earth was a 3D model, best I could do. I enjoyed doing the type treatments such as punch-through, outline and glows. This was PhotoShop 2.5, mind you! 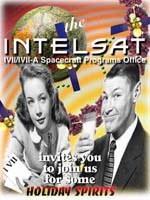 Still flying 10 May 2001, a good satellite. Second of a series of collaborations with the launch team. 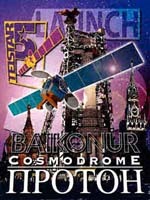 This poster was based on the idea of transporting the launch base to downtown Moscow for the illustrious proceedings. Silly idea but a great image. The rendering was based on a digital composite of the images of the launch pad and Red Square. The only cyrillic font I could find was Greek, but whew, none of those really strange characters were required to spell "proton". I guess the russian-speaking members of the team really liked them and we made cups and shirts as well. Hats off! Thanks to the Optus-C1 Team! 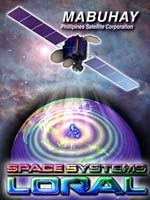 PanAmSat-6 and -7. 6 was de-orbited and 7 is still working.